When looking for a truly iconic Gibraltar restaurant you need look no further than Biancas in Marina Bay; the original waterfront restaurant. Biancas opened its doors in 1979. Boasting views of the bay and marina from its quayside location, many locals and visitors regularly choose to dine on the outdoor terrace area to watch the sun set behind the cornucopia of boats and seafaring vessels as they gently undulate at their moorings. There are few better locations for a realistically priced, friendly and delicious dining experience within Gibraltar. Serving up a variety of sumptuous starters and main dishes, ranging from seafood, to meats, speciality pizzas and salads, Biancas has a plate to suit all tastes. In fact, some say that the reason that Biancas has been so successful over the last three decades is because it has barely changed its menu. All the local favourites are still present, with many regulars always selecting the same dish with every visit. Why change a winning formula? 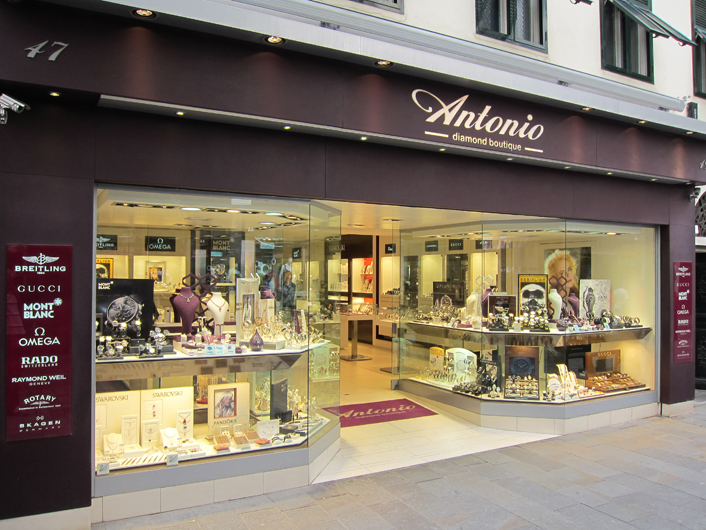 Antonio Diamond Boutique, at the beginning of Main Street, offers you the very best in luxury jewellery. The brands are second to none, including Omega and Breitling watches, Mont Blanc pens and for the ladies, a vast range of Gucci and Dior. The products stand tall like a pride of animals claiming their territory in their natural habitat. The collections, ranging from custom made, unique diamond jewellery, through to the latest Omega watches in Gibraltar gives you the impression that you could be any where in the world. In Gibraltar, there may not be many nightclubs, but the ones we do have, know how to party. Seven used to be known as Chao Gibraltar, but has since refurbished the look and feel of the place and has become one of the Gibraltar night life scene’s biggest contributors. Nightclubs in Gibraltar can be hard to distinguish. The music types, the clientele and the drinks can often be very similar, but the truth is each of them has their own unique vibe. Seven has become known for it’s great music, drinks and a wonderful atmosphere. The Dark Knight Rises - Out of the Darkness, a Hero must Rise! Eight years have passed since The Joker wreaked havoc in Gotham City. Eight years have passed since the death of District Attorney, Harvey Dent. Eight years have passed since Batman’s self-imposed exile. Eight years since the Dent Act allowed the city to round up and imprison its most notorious criminals with complete impunity. Eight years of crime-free streets. Eight years of peace and quiet. Eight years is a long time, and now, Gotham’s hour of reckoning is nigh! Christopher Nolan’s long awaited finale to the Dark Knight Trilogy has arrived in Gibraltar with a bang! Since the second instalment, 2008’s The Dark Knight, he busied himself with another small project, Inception (2010), and many features from that movie behemoth can be found in The Dark Knight Rises. The sequences are bigger, faster and visually astounding. This is Nolan at his storytelling best – both visually and verbally. A talking, smoking, drinking, drug taking, abuseful, lovable and cuddly teddy bear. The film is about a lonely child wishing that his “best friend”, a teddy bear, was alive to keep him company. Boom! It happens, Ted comes to life and a young boy is filled with hope and joy once more. Fast forward twenty years and Ted is still around, still enjoying life as John Bennett’s (played by Mark Whalberg) best friend, the only difference is they’ve grown up, well they’re older, not necessarily more mature.